Initially, you'd be forgiven for noticing a whiff of Portal emanating from the trailer for first-person physics puzzler Magrunner: Dark Pulse. That smell quickly dissipates, as the tone shifts towards an extremely earnest brand of psychological horror. This is why you don't put Cthulhu in charge of scientific testing. Honestly, you thought GLaDOS was bad? 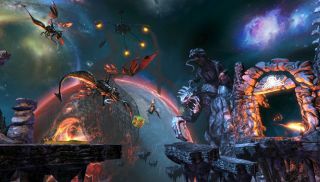 "Magrunner: Dark Pulse is an action-puzzle game in which technology confronts the Cthulhu Mythos, as imagined by author, H. P. Lovecraft," claims the game's description. "You are Dax, one of seven Magrunners selected among the elite to participate in MagTech Corporation's space training program. But, what should be the chance of a lifetime quickly becomes a horrific nightmare." Mostly, it seems, you'll be solving puzzles through polarizing environmental objects with your magnet gun. Then Cthulhu happens. Magrunner will be available in a few hours on Steam .